Best Cheap Electric Skateboards: We review Under $200 & $100 Picks. Whenever some new and exciting gadget finds its way to the market, the price tag that hangs on its package is usually too high for average consumers to bother. But as time goes by and the technology becomes widely available, aspiring manufacturers always find a way to fill in the lower price segments with their offerings. Fortunately for us, electric skateboards have been with us long enough and budget-friendly manufactures have answered the call. On the downside, entry-level segments can often be described as “dirty deeds, done dirt cheap.” Electric skateboards are no different. Robbing you of your hard earned money just looks like a too good of an opportunity to be missed. That is why we are going to give a shout out to these six best cheap electric skateboards that deserve your attention and break this notorious reputation. Very Cheap! Get this one if you are really on a tight budget. Well, let's get to it then. Here's our review of the top 5 cheap electric skateboards. We consider the AC Electric Skateboard to be the best electric skateboard under $300 and living proof of just how good a cheap electric skateboard can be. Don't believe us? The improvements this board makes over the entries we’ve seen above are noticeable in virtually all departments. Let’s start with the materials and the way they’re put together. The deck is made out of six-layered maple wood sandwiched between two layers of bamboo on the top and the bottom. This combination lends the deck incredible resilience without adding too much to its weight. The grip tape that overlays the deck does a great job at keeping the rider’s feet in place. Although they don’t have nearly as much to brag about, the wheels are tactile, well made and durable. The unit is powered by a 350W brushless motor which produces above the average speed and excellent load. The Samsung-produced battery, unfortunately, falls more in line with the products we reviewed above and produces a pretty average range. And now let’s talk about the performance. The board works like a charm. Controlling the unit, even at high speeds, is incredibly smooth and we are happy to report that the skateboard can even climb some slopes. We have to give a special shout out the way the board handles the acceleration extremely well. At no point, you will feel that you're losing control or that the unit's slipping under your feet – in spite of the fact that you will get from zero to full speed in a matter of seconds. 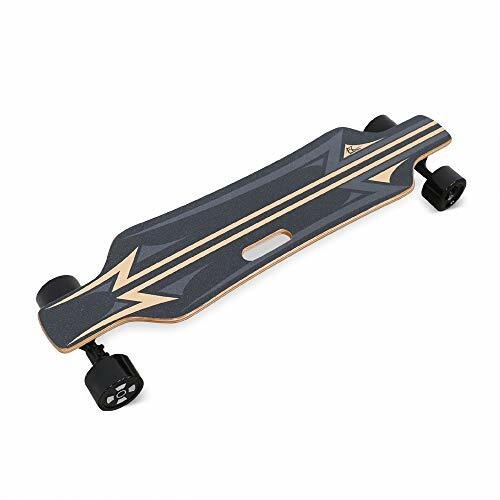 So, to conclude… Keeping in mind all the limitations of the electric skateboards that sell under 300 dollars (for instance, you will always struggle to find the right weight/range ratio) AC Electric Skateboard has surprisingly few drawbacks. You will have to pay a couple of dollars more, but you at least know what you’re paying. When it comes to the specs, AC Electric Skateboard definitely manages to rise above the competition in more than one department. Let’s start with the speed – this bad boy can breeze at the speed of pretty astonishing 27km/h. In this price range, it’s a real catch. Also, the skateboard can successfully carry the weights up to 136kg. You won’t have any problem getting it to work even if you have a backpack with you. The rest of the specs are more or less pretty standard – the unit weighs 7kg and covers the range 16km in one charge. Although not particularly feature-rich package, AC Electric Skateboard does offer some pleasant surprises. For instance, this time you get to choose between the three-speed settings (low, middle, and high) and holding down the brake button will offer a nice take off assistance as you go. Brushless motor works pleasantly quiet, and the controller feels well-made and responsive. It doesn’t take more than a passing look on Voyager Neutrino Compact to see the skateboard means business. Its design is sleek, mean and on-point. Who can say no to a black-clad peace of menace? It is also good to see a raised tail which makes manual braking extremely easy – well at least if you don’t want to damage the board. Throw into equation slim battery/motor combo, and you’ll get a unit that scores one of the best looks on the list. The build quality is not that bad either. The carbon body may leave some purists wishing for hardwood but it manages to score a pretty good balance between light weight and durability, and shock-absorbing wheels can survive even the rougher terrains. You could even try throwing off-road skateboard wheels on it, and use its decent ground clearance to your advantage. One of the benefits of this molded construction is the IP55 certification which ensures the skateboard will be able to deal with light rain and occasional splashes. As for the performance, we are glad to say that, considering its price and position on the market, the skateboard feels pretty snappy and responsive. However, it should be mentioned that the board's motor is powering only one wheel so you might need some time getting used to the handling. The bigger problem, though, is the poor battery life that won't allow you ventures far from home. Still, a rock-solid entry that has excellent value and sells at a bargain price. We already mentioned that Voyager Neutrino Compact has a pretty poor battery life, so let’s move this issue off the table first. When fully charged, the skateboard will be able to traverse only 11km in one go, which is way below the average, even in this price range. From this point on, things only get better, though. The unit weighs only 4k so you won't have any problem carrying it around or driving it manually, and the skateboard is capable of flying at pretty solid 20km/h. So, even though you are not going to ride far, you will at least travel fast. Oh yeah, the board can also carry loads of solid 90kg. When it comes to advanced features (take advanced with a grain of salt), it should be pointed out that the unit’s remote is extremely well-built and pleasant the use. You also get the option to choose between two driving modes (beginner and expert) and check the remaining battery life both for skateboard and remote as well. RazorX Cruiser is a skateboard that, on the first glance, looks like a solid improvement over the previous product we reviewed. For a start, the board looks way better and sells at an even lower price. Also, there is a welcome option to replace the battery, which comes in handy when dealing with riding times we’ll cover in more detail below. Also, the unit is very light and more in tune with younger customers. On the other hand, the motor we get in the package presents a noticeable downgrade which has its effects on the core specs. But, we already agreed that cheaper units always entail some compromises. What about the overall performance? Well, the unit definitely over-performs for what you are asked to pay. Take a couple of minutes to adjust to the controls and the tactility of the board, and you will be able to effortlessly breeze between the obstacles. Since the motor runs the wheels directly rather than by conveyor belts and the unit is light enough, you won't have any problem kicking off manually once you see battery depleting. So, we are talking about the boeard that is somewhat underpowered but very light and performs surprisingly well. The build quality is solid and, and high-grip urethane wheels do a great job keeping the unit firmly on the ground. 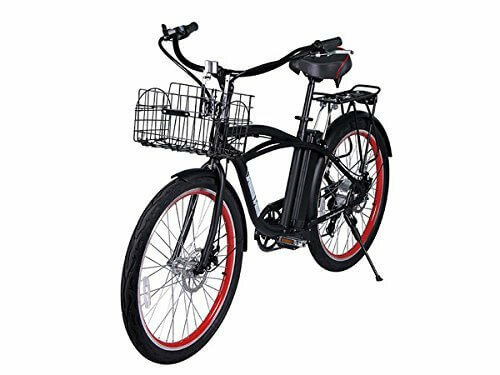 Bottom line, although not without its flaws, RazorX Cruiser is a product that feels very suited for its target audience and delivers excellent performance in its price range. As we already pointed out, with its mere 4.5kg of weight and the deck-length of 754mm RazorX Cruiser feels extremely compact. The top speed of 16km/h is definitely not something to brag about and even the smaller inclines may pose a serious problem, but at least you will be able to squeeze about 40 minutes of continuous use out of single charge. What's truly commendable is that, even though the skateboard's motor is definitely not amongst the most powerful on the market, the unit can still carry the impressive weight of 100kg. As for the features, RazorX Cruiser is pretty by the numbers. However, 2.4 GHz remote is well put together, urethane wheels lend the unit a great deal of stability and the rear-wheel-drive motor features nice LED indication to tell you the battery status. For what it’s worth, the unit comes fully assembled, so you won’t have to get your hands dirty. Say Yeah Electric Skateboard might just be the most by the numbers product we'll cover on this list. Its design is purposefully bland. The package is bare-bones – you get the charger, remote and that's pretty much it. Even the fact that the manufacturer decided to highlight that the unit comes semi-assembled speaks volumes about the lack of any advanced features. But, it’s hard to deny the thing does what’s it’s supposed to do. You get your wooden deck (the manufacturer doesn’t mention the type of the wood, but the material feels reasonably tough), a nice set of wheels and a powerful 400W motor. It is also worth mentioning that the unit performs fairly well. Of course, riding won't feel as smooth is it would if you spent a big grand, but the stability is good, speeding up and braking feels smooth and, with the exception of huge clearance you need to have, steering works very solid. The gun-type controller is put together well, and what’s even more important doesn’t produce any delay, which drastically improves the safety of a rider. On the whole, calling Say Yeah Electric skateboard uninspired and underwhelming would be extremely easy. But, you have to remember that this product is aimed at children, teens and skateboarding newcomers and sells at an extremely affordable price. Also, you do get a pretty solid core performance. So, there's very little to complain about. Appropriately for its target audience, Say Yeah electric skateboard is a very compact unit. It measures only 1000 x 305 x 160mm. However, the weight of 18kg (the majority of the weight can be blamed on the bulky motor) will make carrying it around once the battery runs dry hard even for the grownups. Speaking about the battery, manufacturer says that the unit can traverse commendable 22km at the speed of 25km/h, which should theoretically solve the weight issue. However, in reality, performance can drastically vary depending on the weight of the rider. The good news is that the board can carry the weight of solid 80kg so your kids won't have any problem using it. As we already mentioned, Say Yeah Electric Skateboard is surprisingly devoid of any advanced features. This is a cheap electric longboard aimed at the budget buyer. However, the controller allows you to quickly change between the speed settings and the deck features a tactile overlay that improves the stability and a nice LED indicator that shows you the status of the battery. Swagtron Swagskate Classic NG-1 is an electric skateboard that has the DNA of the youth-oriented product. Hey, it even has the word "Youth" in its name. However, the manufacturer has made sufficient number of refinements to nudge skateboard into the casual league. The effort can be seen simply by looking at the neat remote that this time features a nice LED display that gives the rider excellent feedback on the boards current status. Also, the deck is made out of high-quality maple wood covered with grip tape that improves the stability of the rider, while the durable polyurethane wheels do a good job absorbing the bumps and providing smooth skating experience. It is also worth mentioning that the skateboard features UL 2272 certification (the standard that evaluates the safety of electrical drive train systems and their batteries) which show the manufacturer’s effort to make the unit feel more premium. As for the performance, it’s safe to say that the unit floats firmly between toy skateboards and casual electric skateboard range, which doesn’t necessarily have to be a bad thing. We’ve already covered two skateboards with core performance that allows very satisfying riding. Swagtron Swagskate Classic NG-1 is no different. Riding is enjoyable, and the unit controls fairly well but serious commuting or climbing the steeper slopes will remain wishful thinking. Still, a couple of nice additions and good build quality do manage to steer the board above the average. Much like the previous product we covered, the Swagtron Swagskate Classic NG-1 is very light - it weighs no more than 4.3kg. As you would expect, this legerity took some toll on the strength of the motor and the capacity of the battery. When fully charged (charging takes three long hours), the skateboard will be able to traverse the distances up to 16km at the speed of 18km/h, which is pretty standard for this price range. Unfortunately, compared to other electric skateboards, this unit's max load falls firmly below the average. You will be able to ride the skateboard only if your weight is up to 80kg. As we already mentioned, Swagtron Swagskate Classic NG-1 uses a pretty nice LED-powered remote which controls surprisingly well and chargers rather fast. The feedback you get is presented in an intuitive manner that won't keep your eyes off the road for too long. Also, the skateboard features built-in handles, which in combination with light weight and the grip tape make carrying around as good as effortless. When buying a cheaper unit, you have to be aware that you will inevitably have to make some tradeoffs. The key to making a good purchase lies in giving the advantage to the features that are truly relevant to the overall quality of your skateboard. So, let’s take a look at some of the most important features that make a good entry-level electric skateboard. Over the course of their lives, electric skateboards are exposed to a lot of abuse. They move at high speeds, need to traverse rough terrains and a couple of crashes are as good as guaranteed. Cheap electric skateboards are often more prone to these strains than others. Furthermore, the skateboard market, in general, is no stranger to built-in factory errors and design flaws. That is why it is in your best interest to find a unit that has a comprehensive warranty and actually read the fine print to see which types of damage are actually covered. You also need to learn are you allowed to do your own repairs, will the manufacturer send spare parts and who’s going to pay the shipping. The battery capacity of an electric skateboard is not always indicative of its range. For instance, heavier the load you put on the drive train, the battery will discharge faster. But, on average, a regular skateboard uses approximately 10-15 watt-hours per kilometer so you can get an idea of how far your unit will be able to take you in a single charge. Speaking in terms of affordable electric skateboards, you shouldn’t expect the distances longer than 10-15 kilometers, which is still good for a couple of joy-rides and casual commuting. As we already mentioned cheap electric skateboards are often not the best-built products in the world. One unintentional crash and they are wasted. But, there are exceptions. Dig a little deeper and you can find some rock-solid units with high-quality maple decks and polyurethane wheels that can carry the loads that go all the way up to 100 kilograms. If you find a board that has these qualities and it’s still light enough to be carried around, you are in for a treat. Regular maintenance is the key to prolonging the life-span of all mechanical devices and this holds true for electric skateboards as well – even more so for cheaper options. Because of that, your job will be to check the quality of the screws and bearings, see if the replacement parts are available in local shops and finally and find out can the electronic parts be dismounted for the purposes of repair. In ideal conditions, your unit should allow you to replace all of its mechanical and electronic components for the replacements that are floating the market. Pre-molded decks and mechanical parts should be strongly avoided. Last but not least you have to make sure that your unit actually performs well. Even the cheaper electric skateboards are flying at speeds that go all the way up to 20km/h. Twitchy performance can cause you some nasty injuries. So, some of the most important things you should cover are the responsiveness of the controller, the way in which the board handles changes of speed (you don't want your board set you flying forward when you simply want to go slightly faster) and the quality of the brakes. Looking for ABS (Anti-lock Braking System) in this price range may be a tall order but it’s damn worth the try. We hope you enjoyed this roundup of the best you can currently find on the market. What do you think about our choices? Can you find true quality without breaking a grand? Let us know and share the post with your friends on Facebook. Do I need to get a driver’s license to ride an electric skateboard? No. Regarding the legal regulations, electric skateboards are no different than rollerblades or, for that matter, regular skateboards. However, if you want to take active participation in the traffic (to drive your electric skateboard on the road) you will probably need to abide by speed limitations that vary from region to region and from country to country. If you buy a cheaper model, though, you will hardly ever come into position to break those limitations. Can I bring my electric skateboard on the plane with me? Unfortunately, although they sound like perfect vacation companions, most of the airline companies don’t allow the presence of batteries bigger than 100 Watt-hours. That pretty much rules out electric skateboards altogether. Can electronic skateboards be used as normal skateboards? Yes. Once the battery runs out, you can use your feet to push the skateboard forward. But, there could be some obstacles. Some units are simply too heavy. Others use conveyor belts to run the wheels so they might offer additional resistance while you're driving. How do LED lights benefit electric skateboards? First and foremost, integrated LED lights are keeping the rider safe by making the rider visible to the traffic in the dark. Second, LED lights can give the rider quick info on the battery's status, which also plays into the safety conversation. The less you need to keep your eyes off the road, the better. Can kids use electric skateboards? Yes. Most of the skateboards can be used by children of the age of nine and older, however, if you are considering to buy the electric skateboard to your kids, you should take some precautionary measures. If you want to record yourself on your new e-skateboard, remember that one hand is reserved for using the throttle remote, so taking selfies might be a challenge. We would recommend you get a go-pro, or a drone that can follow you around! Check out our sister site, Buy Best Quadcopter for some good quads under $200. First, give your children a couple of training sessions on the regular board so they can master some basic skills like keeping the balance. Second, don’t allow them to ride the units that can pick too much speed and produce too big of a momentum. The slower they ride the better. We hope you enjoyed this roundup of the best cheap electric skateboards you can currently find on the market. What do you think about our choices? Can you find true quality without breaking a grand? Let us know and share the post with your friends on Facebook.